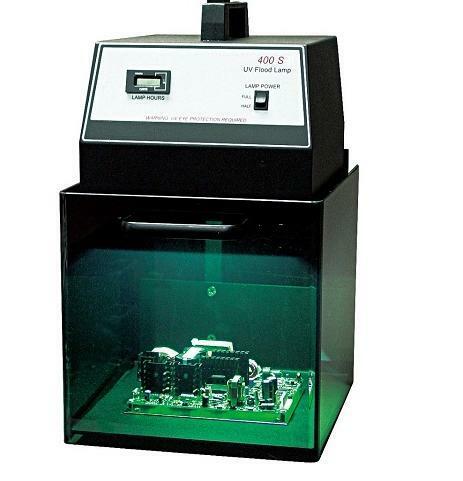 Economy Flood (with stand and shield, shown right) is a low-cost 400 watt UV flood curing system (600 Watt is Optional). The long life metal halide lamp and parabolic reflector illuminate afull 8 x 6 inch curing area with evenly distributed light with a full 100mW/cm2 UVA in the work area. 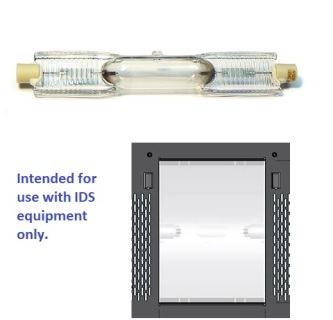 The Auto-Ranging90-132 / 180-265 VAC line input makes the low-cost UV flood easy to use any where in the world, without any wiring changes or voltage select switching. With the optional 600 watt power supply, system is a full 150mW/cm2. An optional rear shield (see left) is available for a complete surround shield. Our full featured Programmable UV Flood Curing System is best when used in small batch applications where strict control over the process is required. It can also be used with ourMotionCure UV Conveyor System, although the conveyor is generally operated in always on settings, with the Economy UV Flood Heads. The unit automatically reduces lamp power by one half when the Standby Mode rocker switch is activated. The switch is conveniently located on the front panel, as shown. This can reduce excessive heat and stray light source and therefore greatly increase the life of system components, without the need to power down. Click here for heat test results. The switch-mode power supply maintains a constant level of lamp power regardless of variations in AC line input or lamp voltages. This regulation provides for repeatable curing times and longer lamp life. A unique baffled-fan cooling system, with removable filter channels,insures system reliability at all times. An hour meter on the front panel (shown) tracks lamp age, allowing for consistent lamp replacement scheduling. Need something bigger? Contact IDS for a special quote on the Extra Large Economy Flood.